I do not like to take what my profession calls ‘positions of added responsibility’ for reasons that I perhaps will explore in a later post. However, I am I great believer in professional development. I know that the vast majority of the public see this as another unnecessary “holiday” in an already vacation rich job. Let me assure that most of these days are no holiday; indeed this latest one was a great deal of work. The facilitator for last week’s session was Lauren Wilson, a retired teacher/administrator who now works as an education consultant and who has extensive experience in effective assessment practices. This may bore the life out of most people, but for me it is the heart of the matter. Without honest assessment there is no student progress, a tenet of education that mountains of research has repeatedly proven. The heart of proper assessment is what is called assessment FOR learning; that is to say, assessment that teaches the student how they can improve what they are presently doing. This is known as formative assessment. In my discipline we teach students how to conduct research and write structural essays that have a credible foundation. If you were to break this into component parts, as I do, there would be fifteen discrete steps. 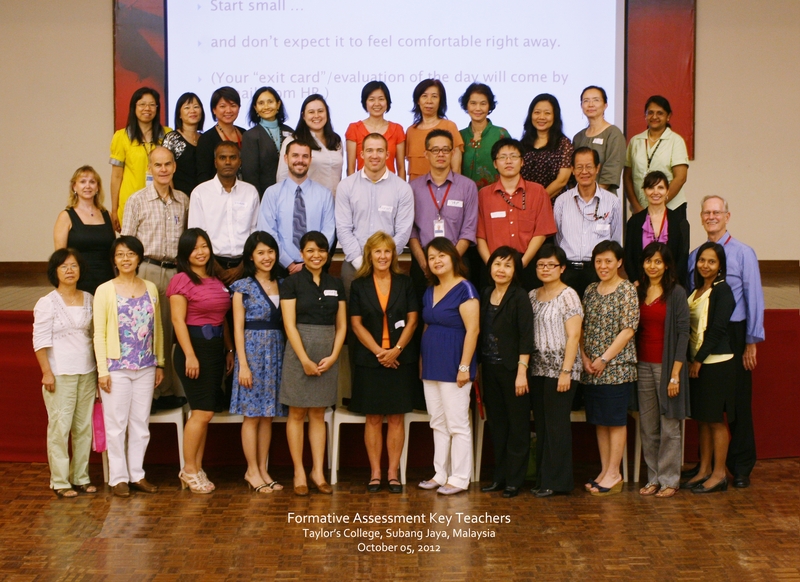 Fourteen of these would be assessment FOR learning; only the last would be assessment OF learning and be recorded. Last Friday I and several colleagues led the three hundred or so teachers of the four pre-University programs through a professional development day to provide greater understanding of this important instrument of student success. We began with a three hour workshop ourselves for each of the three days prior to the PD day. I already teach a full load and then volunteer to cover the study hall for a period each day, so these three days really taxed me both mentally and physically. But Lauren was enthusiastic and knowledgeable and it was a worthwhile week of learning for me in which I acquired a number of new techniques, some of which I have already put into practice. On the PD day itself we got to teach our colleagues what we ourselves had learned and that too was worthwhile. Our team consisted of me and Shelley, a colleague from this program, and two other ladies from one of our sister pre-U programs. I have to say that we did a more than creditable job in the three workshops that we ran. Far from being the slack day that the public views professional development as, it was a full and demanding week of learning and teaching in addition to my regular teaching load, and I am looking forward to a somewhat more reduced load for a while so I can get caught up on my regular teaching duties.